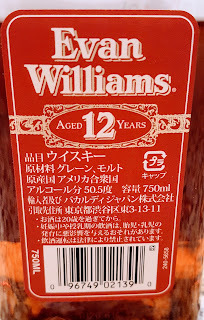 Despite the occasional weird bottle, I like the Evan Williams bourbon range. They're priced very reasonably. Hell, I'll say it. They're cheap. Yet, they're often a good measure better than bourbons 4x-5x their price. 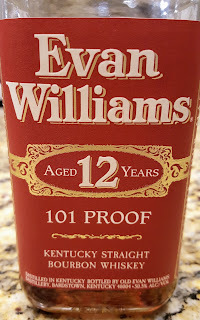 At the Heaven Hill distillery shop, a customer can find Evan Williams 12 year old 101 Proof. That's the only (legal) place in the US one can buy a bottle of it. And it costs at least $130. Or one can buy it at most liquor stores in Japan for $25-$30. Guess where I bought mine! I considered getting a second bottle, but my luggage was already full of other fine things. Like dirty laundry and travel toothpaste. My uninformed guess is Heaven Hill doesn't make EW12 a regular American release because the demand would far outstrip the supply, and we'd kill it off in under a year. Anyway—to keep jumping back and forth between thoughts—I opened my bottle the very night I came home from my trip. Though the nose shows plenty of oak, it reads very pretty and fragrant, rather than massive char or sawdust. There are also big notes of peach skin and brown sugar. Some sherry cask-like dried fruit. Hazelnut liqueur. A mellow vanilla and Cow Tales candy undertow. In a tumbler glass, the oak notes move to the background. The palate leads with fresh cherries, orange soda and a warming heat. The sweetness stays around the edges, wood spice in background. A burst of ginger beer. NO vanilla. It develops an intense saltiness with time. The tannins remain surprisingly mild in the finish. The sweetness stays mellow too. Limes, clementines and fresh ginger. A hint of the palate's salt. The bourbon stands strong in a Manhattan, giving it a real punchy boozy edge. There's also a cherry bubblegum note. Bit of a peach+cinnamon thing. I'm sipping one of these cocktails between sentences and enjoying it immensely. This one is growing on me. It is NOT worth anyone's $130 (plus tax). But I'd be happy to keep this regularly stocked if it sold for $30 or less here. Which will never happen. While it doesn't have the finesse of Elijah Craig 12yo (R.I.P. ), it manages to keep the oak in check. I really enjoy the fruit notes. And it sticks the landing well. Plus these Manhattans are mighty hardy. Yum. If you're drinking it neatly I recommend you consume it from a tumbler as opposed to a Glencairn. 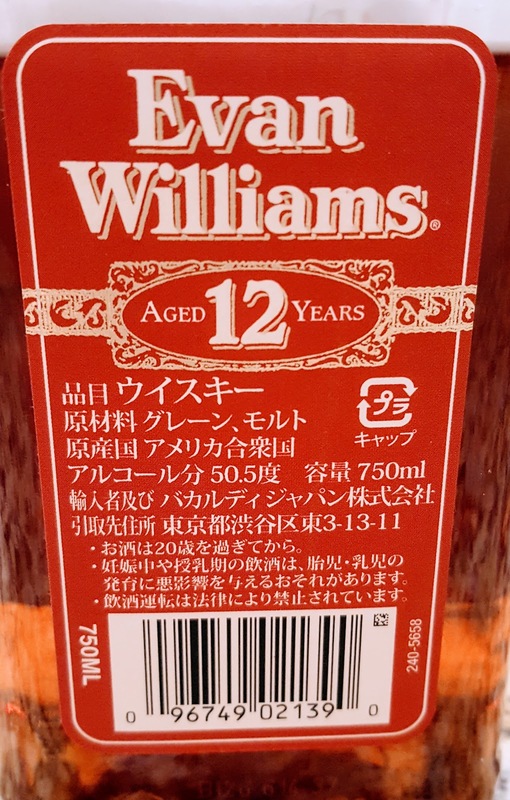 So if you're in Japan, and still have room in your luggage because you haven't already found a dozen other wonderful things, Evan Williams 12 year old 101 proof is a pretty fun thing to bring home.